Let’s say you have some work to be done and you really need to buy an air compressor (after all, that’s why you are here). But, the choice is not as simple as it might seem at first. Sure, you no longer have to go from one hardware store to another in a seemingly endless search for the right piece of equipment, because everything is available for you online 24/7. However, there are a few issues with that. You get too much choice (yes, there is such a thing) which might lead you to give up like I almost did. Despite all the choice, I’ve learned there are times when you do have to make a compromise. If you don’t want to spend a lot of money, you have to buy a lower quality product. If you want a powerful compressor, it’s going to be too loud. However, I’ve come across a unit that means you don’t have to choose between power and quiet operation in the form of the DeWalt DWFP55130 Heavy Duty 200 PSI Quiet Trim. This air compressor is mainly suitable for trim work (as indicated by its name). It provides a max of 200 PSI of pressure and features a 2.5-gallon tank as well as 90 PSI at an air delivery rate of 3.0 SCFM which is more than enough for extensive nailing. The pump is based on an oil-free design which takes maintenance out of the equation since you don’t have to change the oil on it. This also extends the life of the pump. This compressor makes very little noise, maxing out at 71db. The motor powering the compressor has a low amp draw making it ideal for easy start-ups, and you don’t have to worry about any of the breakers tripping either. Its dimensions are fairly miniature since its only 14 inches wide. It’s very light too, weighing just 36lbs which ensures maximum mobility. Additional features include a ball drain valve which gets rid of moisture that can build up inside the tank over time. When compared to compressors that feature a pancake-style design, this one is able to fill the tank about 15% faster. I should also explain the benefit of that impressive 200 PSI number. You see, if that number is high it means the tank can store more compressed air (no more pressure drop for you)! This is especially true with this model since it fills the tank when the pressure starts to dip below 165 PSI which I think is a nice buffer to rely on. The high-torque motor is made to function in cold weather conditions even when hooked up to an extension cord. Since this is primarily a trim compressor, it will most likely be used indoors most of the time. Noise is not much of an issue when you use your compressor outside, but indoors it will not only annoy and disrupt communication with other people, it can also damage your hearing over time. Fortunately, the unit is superbly quiet, even when compared to pancake compressors. 71dB is an impressive number, so you will have no problem communicating with your co-workers while operating this device. While some compressors really push the term “portable”, this one is a true example of a portable compressor. Weighing just 36lbs, it is extremely convenient for frequent transportation. Its roll bar is designed not only to protect the vital components of the compressor from getting damaged, but also to act as a carrying handle. I like how the controls on this one are inset from the frame for additional protection. Another nifty thing about this air compressor is you can use it whether it’s placed in a vertical or horizontal position. Obviously, it’s always better to go with the horizontal orientation for increased stability, but sometimes the footprint of the compressor will be too large so it’s nice to have the option. It also comes in handy when you are several inches short on cord. Simply flip the unit over, and problem solved. If you are looking for a powerful indoor or trim compressor which won’t make your ears bleed in the process, this heavy duty compressor comes highly recommended. People who have bought it absolutely love this punchy little unit. 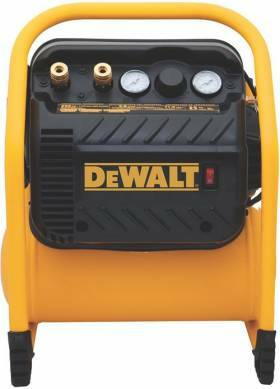 Packing plenty of power for any kind of home repair and renovation, this model has definitely earned my recommendation. If you are curious to know more, or you want to purchase it go to Amazon and find one at a great price.